The new iPad is a much better device for enjoying videos than iPod and iPhone. However, if you want to watch movies on your iPad, the file must be small enough to fit the device's available storage space. Compressing movie files will make them smaller, allowing you to fit more clips onto your iPad and giving you more choice of movie to watch. Most files can easily be compressed by using compression software such as WinRAR or WinZip. Video files, however, require their own compression software as they must be compressed without interfering with how the video or audio is displayed. iPad Video compression software is easy to find and may include basic or specific tools to compress videos and perform related tasks. To narrow the user's search, here are some compression fixes to make video size smaller for iPad playback. One way to get a movie to the iPad, is to first put it in the iTunes library, then select the file in iTunes, and choose Advanced > Create iPad or Apple TV Version, and iTunes will make a new copy of the file in the correct format for syncing to your iPad. It'll compress the movie to about 4mbs. However, like most other Apple presets/applications, if you have numerous chapter markers in the original movie iTunes will ignores all tracks other than audio and video during such conversions. The quickest and easiest way to compress videos for the iPad is to use the iFunia iPad Video Converter for Mac, which will compress a video file for iPad while still retaining the quality of the original. 1. Download the latest version of iPad Video Converter from iFunia and launch it. 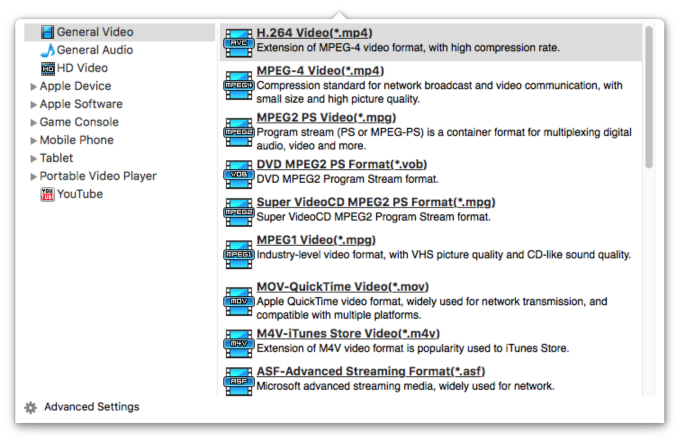 Select the source video file you want to convert to iPad compatible formats. FLV, M4, AVI, MOV, MKV, etc all work fine. 2. In the "Output Format" dropdown list, select the device you want to optimize the video for. 3. Click on the conversion button and wait, iPad Video Converter will convert the video to the format you chose. I always find it easiest when I've got an outline of exactly what settings I should use to get the best balance of size, quality, compression settings and compatibility for iPad. Following are the settings that I use most frequently when exporting video. After you load your video file to the program, clicking Settings button to pop up the editing window. Resolution: iPad screen resolution: 1280*720, it is a good compromise and does not look excessively degraded when viewed in full-screen iPad playback. Channels: Choose 2.0 Stereo (LR).